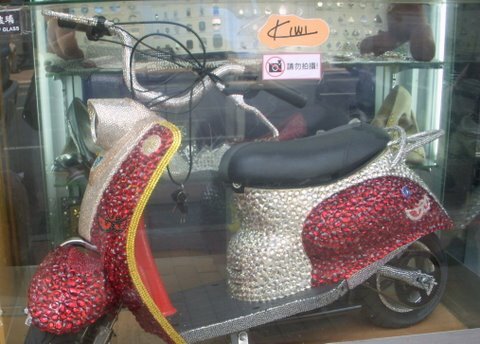 A sequined Vespa scooter; spiraling spools of multi-hued ribbons in satin, velvet, nylon, shimmering and embroidered; laces broad or gossamer thin stacked on shelves or dangling from ceiling, glitzy buttons and beads in plastic, glass, iridescent, metallic and chunky; art glitter in multi-layered hues; belts and buckles; paper trimmings and accessories; fabrics in myriad textures and tints reminiscent of Hansel and Gretel’s fairy tale chocolate house… tempting and portentous. This is Sham Shui Po, the effervescent clothing wholesale and computer accessories hub and one of the earliest developed areas of Hong Kong. Easily accessible by train, bus or cab from different corners of Hong Kong (from Tsim Sha Tsui board the Red or Tsuen Wan Line and exit at A-1) old residents vouch that Sam Shui Po has seen better days. 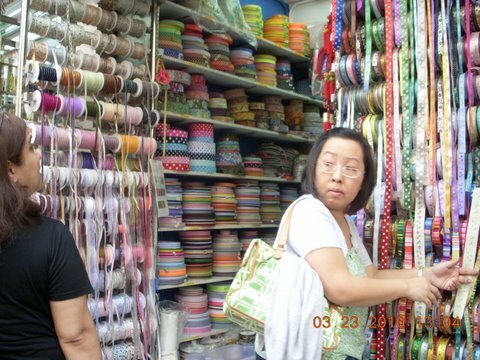 But despite chaotic infrastructure and disintegrating buildings Sham Shui Po has managed to hide amidst the kaleidoscopic street colors of Nam Cheung Street or simply the Lace Street, Ki Lung Street or Button Street and Yu Chau Street or Bead Street. Shake off the ‘beads and buttons’ tango in a labyrinth of alleys and side streets. This is street market in full swing swamped with carts and tarpaulin covered stalls balancing between pavements and tar and piled high with toys, plastic goods, umbrellas, electronic and rubber items, incense and paper goods. Particularly interesting are the paper ‘ancestor items’ such as Mahjong sets, mansions, television sets, clothing, household and daily use items sold in paper bags to be ‘cremated’ as offerings to ancestors. From here saunter into Fashion Street or Cheung Sha Wan Road. This market is mostly wholesale and watching me drool over a linen blouse, the sales girl shooed me out with ‘wholesale’, ‘wholesale’. Some stores do let you rummage to select a single piece but then it has to be ‘quick’ decision. The stores that do let you buy somehow do not have the same quality or design and here walking out is in self-interest. Other places worth a look are: Golden Computer Center or Arcade on Ap lui Street for electronics and accessories; the crowded Dragon Center Mall with its ‘brand’ shops, local merchandise and playing area for children. The surprise is the 4th floor bazaar with tiny cubicles selling toys, kitschy jewelry, beauty shops and general stuff. 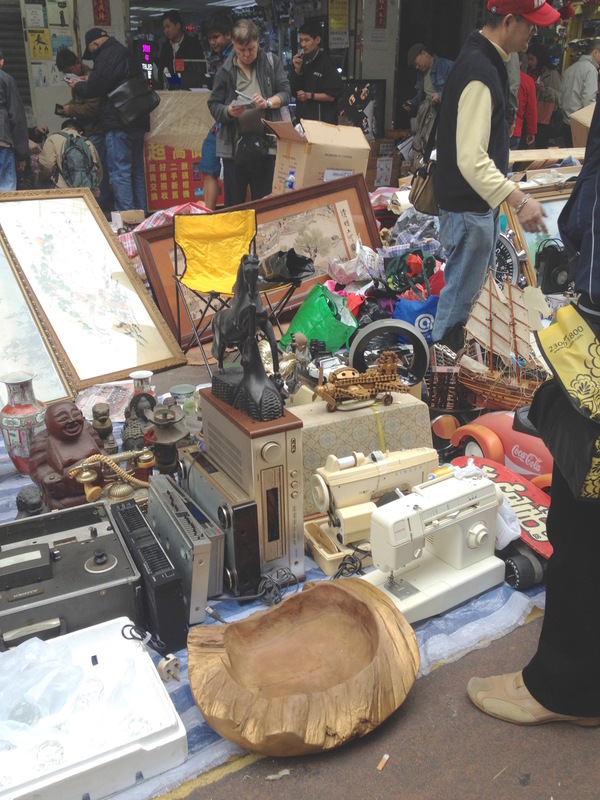 Weave your way through the human tidal wave and think about the wholesale-ness of Sham Shui Po. Exits A-2 and C-2 for Ap lui Street (Golden Computer Centre and Golden Computer Arcade). Exit D 2 for food streets.